It is both easier and more difficult to write about the Smith family than about any other British family in pre-revolutionary Moscow, simply because their story is very well researched by Harvey Pitcher in his book The Smiths of Moscow, and therefore there is so much information about them! His book is based on the reminiscences of one of the younger Smiths of Moscow - Harry Smith - and so is very trustworthy. 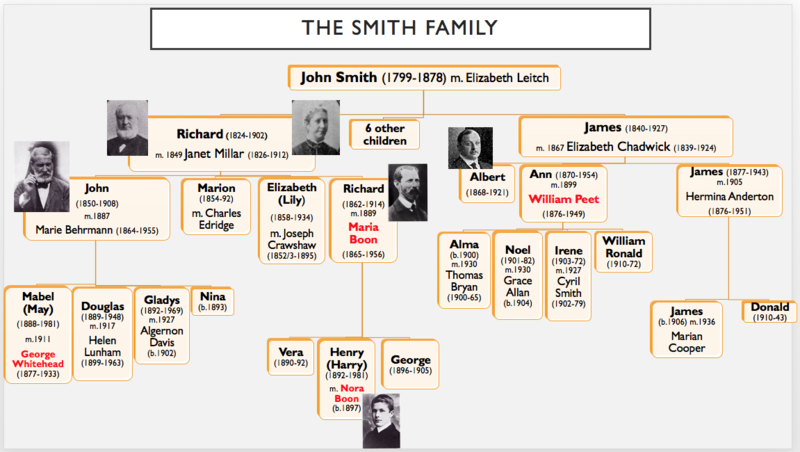 The Smiths were one of the wealthiest and best-established British families in Moscow. The first Smith came to Russia in 1847, about the same time as the first Hopper, as well as the McGills - owners of similar enterprises. Just like the other two families, they played a very active role both among the British community and in the Anglican church in Moscow - first the British chapel and then St.Andrew's. Just like the members of the other two families, the Smiths were church wardens: the old Richard Smith from 1862 to 1866, and his son Richard from 1903 to 1910. The first Smith of Moscow - Richard Smith (11 August 1824-1902), came to Russia in 1847 at the age of 23, as a technical expert to work at Kolpino (near St. Petersburg) at the locomotive-building facility. Richard Smith was born near Glasgow at West Arthurlie to the family of a cotton spinner. At the age of 16 he moved to a nearby town of Greenock where he served his apprenticeship to the trade of boiler making and iron shipbuilding with Messrs Caird & Co., then a short time with Scott & Co. After that he joined the engine staff of the Caledonian Railway Company where he helped build the Railway's first locomotive. It is with this important knowledge that he came to Russia and was first put in charge of a small boiler and tank factory, but very soon afterwards - in March 1847 - was transferred to the locomotive shops.